Here are a few shots of some corals I recently added to Tim & Tracy's 650 gallon mixed reef tank. These were just quick snapshots for my client to get an idea of what I have in stock, "What You See Is What You Get". I sent Tim thirteen photos of various soft corals that I had in stock and he purchased all of them. The Clavularia Clove Polyps are also commonly referred to as Eight Tentacle Polyps, or Encrusting Polyps. 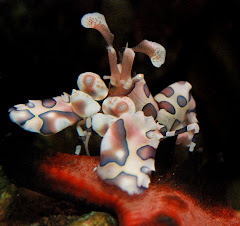 They are brown, tan, pink, green, or white in color and their polyps have the distinctive eight-leaved tentacles associated with all the members of this family. 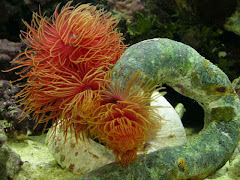 They are colonial animals with several individual polyps attached to a single piece of live rock and are often stung and damaged by other aggressive corals. 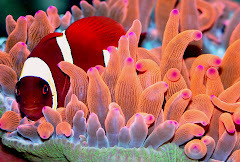 Therefore, they need adequate space between themselves and other corals. They are not difficult to maintain and require moderate lighting combined with moderate water movement. They require the addition of iodine and other trace elements to the water. 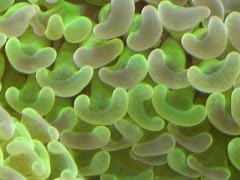 They will grow rapidly in the established reef aquarium by encrusting over adjacent rock work or even other corals. NOTE: This specie was being harassed by Tim & Tracy's Emperor Angel over the Thanksgiving holiday weekend and was removed today. While it is possible to keep many "impossible" species with the large Pomacanthus Angelfish, the Emperor most likely got a bit hungry and picked around a lot over the extended holiday when Tim & Tracy were on vacation. A well fed angel is a happy angel. Sun Polyp Coral: Orange, Tubastrea, Tubastrea faulkneri, Commonly called Sun Coral or "Sun Polyp", this is not a "polyp", as in a type of "Zooanthid" or "Polyp Rock", rather, it is a hard coral. It is non photosynthetic and should be fed for successful long-term maintenance. Offer frozen brine shrimp, mysis shrimp, finely chopped shrimp, seafoods, etc. Has been known to thrive for years in public aquariums, but requires dedicated care. Requires good water movement and dim or indirect lighting. 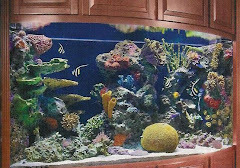 Preferably, place in shaded areas of the aquarium. Pieces run small, larger pieces are seldom available. Note: This coral is thriving in Tim & Tracy's aquarium. Xenia sp. ; Pom Pom, Very popular among xenia species, it's very attractive . It does not grow as fast as some other xenias, but it has a nice white/pink color, another one of the premium strains of xenia. They grow best in medium to high lighting, and feed on phytoplankton (marine plankton) and reef supplements, such as iodine, iron, strontium and trace elements. 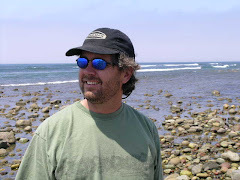 Photosynthetic, no direct food required, but Phytoplankton does accelerate growth and color. NOTE: These guys were pulsing big time today, looking great! Tim has been feeding a smorgasbord of my fresh/frozen food mixture and the Reed Mariculture Roti Feast, Phyto Feast and Artic Pods. If you're a client checking out my page, please let me know if you would like to receive a WYSIWYG email of what I have in stock. Anybody know what my plate means? When I first got my new van not too many people could come up with the chemical formula breakdown, NaCl, sodium chloride (salt) and the molecular compound H20 (water). My plate frame is from Tropical Penguin Scuba in Reno where I maintain their three aquariums. Their showpiece fish is the football size porcupine pufferfish "Hootie". 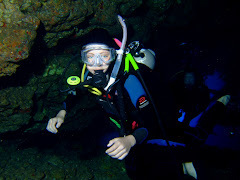 If you're a diver in the area, Kevin's store is the best in Northern Nevada and you probably already knew that. Or if you are just planning a vacation to Hawaii or the tropics, stop in and pick up some snorkeling gear. Do you really want to breath through a rental snorkel? 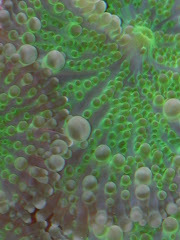 I have taken a number of photos of "WYSIWYG" (what you see is what you get) corals for Tim & Tracy's aquarium this week and will try to post a few soon.